Hearts had the most liked content! Thank you @Frank65 for constantly working on this & updating us! My sincere thanks! Hi All I have downloaded Frank65's Theme utilizing Replay, looking & working great! I tried charging via the USB & it charged it up to only 52% & then stopped the display light when from red (charging) to green (done?) Is there a setting via Escribe that I can adjust? Can someone tell me the steps? Before this theme I was using Daniels DJLSBVapes & it charged to 100% via USB. I didn't change any settings in Escribe. Thanks for any help. Hi @Frank65 I’m using your theme, I tried charging w/the usb & the mod will only charge up to 52% is this something that is only happening with me? Or can I fix it in Escribe? If so, can you tell me the steps to allow it to charge to 100%? Thanks! Thanks! We already found it, but appreciate it nonetheless! Does anyone know how to get SP15 apparently that’s what’s needed to upload Replay then chose a theme. I really don’t know what Evolv’s intentions are but if you watch the video “Vaping Biker” did with Evolv (guy, I forgot his name)on Youtube he stated that they are working on pushing out the board for the 250C (at that time) & that Evolv was working on the 75C at the same time but their main focus was at that time the 250C . And it is forthcoming in the near future. Perhaps when in production, they thought the “replay” will be rolled out by the time the mods reach customers? 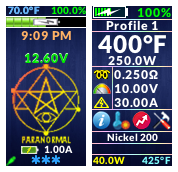 As far as we know Evolv is still working on it & are working on rolling out the 250C first at the same time as programming the upgrade for the 75C’s. I think when its available via Escribe everyone with a 75c will have access to it. Thanks for translating! Seems like it’s going to be great! I’ve tried looking to see if they released the “Replay” for the DNA 75C’s. But I don’t see anything posted I clicked here there. Where should I be looking? That’s great! I wonder if it’s available? I’ll go & check.